In the fifth of my series comparing the two Disneylands closest to my heart (California and Paris), I shall be looking at selected references to the 1941 movie Dumbo within the parks. Please note, I am specifically referring to the Dumbo paraphernalia within the Magic Kingdoms, rather than anything related which can be found in the hotels, the other parks (such as in Off The Page and World of Color at Disney's California Adventure or Animagique and Art of Disney Animation at Walt Disney Studios Park, Paris) or elsewhere within the resorts. The obvious place to start this article is with Dumbo The Flying Elephant. This ride exists, with the same name, in all five Magic Kingdoms. It appears in the Fantasyland of each, but the California version was the only one not to be an opening day attraction. It opened in August 1955, not July as most people believe, due to the 700pound weight of the fibreglass pachyderms being too heavy for the initial mechanics to lift. The attraction is practically identical in both Paris and California, down to the water features (non-existent in Florida due to the utilidors beneath), the topiaries, the lengthy queues, the overhead storks, the chipmunks in the spokes and Timothy Q. Mouse on top of the hot air balloon in the centre of the hub. In France, Timothy has always held a feather. In California, although he had a whip when the ride first opened (and does again now), there was a period of time when he too had a feather. Both versions feature a steam organ which originally played live, but now plays pre-recorded music on a loop. The loop in Paris lasts 28 minutes, whereas the one in California lasts approximately two hours. Both versions seat two to a carriage and have a lever for controlling its height. In California, a ride will last a minute and a half; in Paris the average ride time is two minutes. When the ride opened in California, it had ten carriages. After the 1983 Fantasyland refurb, when the location of the attraction was moved to the site of the former Skull Rock and the design was improved dramatically, there were still ten carriages. However, after "bruises and scrapes" were caused when an elephant separated from its support arm in 1989 (and after a similar incident the following year, in which an arm collapsed completely) the ride was temporarily closed. It was replaced in November 1990 by a version with sixteen carriages which had been originally built for Euro Disneyland (as it was then known). By the time the French park was opened, a sixteen carriage replica was built and installed therein. Obviously, the Paris version doesn't have the history of the West Coast one. This history includes, but is not limited to: Harry S. Truman's 1957 refusal to ride due to the elephant being a Republican symbol, The Carpenter's 1975 hit "Please Mr. Postman" being partially filmed thereon, the occasional carriage being sold for impressive sums, the original hinged flapping ears which never worked, the gold carriage to celebrate the park's fiftieth birthday and the original intention to paint the elephants pink before Walt allegedly interjected about how this would make a mockery of the no-alcohol policy. Incidentally, the reason for initially wanting the ride to be based around the Pink Elephants on Parade scene from the movie (and releasing publicity posters depicting the attraction as being themed as such) is that, in the same way as there is only one Mickey Mouse, Walt believed that Disneyland should only have one Dumbo. However, regardless of all the history behind the California attraction, there is one reason why I believe the Paris ride is by far superior. Cast Members in Disneyland in Anaheim hand out feathers to those waiting in line. They then symbolically take these away before the Guests board. This is supposedly to demonstrate that (like in the film) you don't need a feather to fly. However, the real reason for these props is to work out who will be riding which time. In Paris, occasionally anonymous bits of plastic are used for this purpose, but generally the Cast Members just count in their head. In this instance, I prefer the methodology of the latter. Although it gives people a greater chance of getting away with the Bubba Swap which I won't explain in case it encourages greater use- it means younger Guests are less likely to be disappointed when they discover their gift was only temporary. Two Dumbos which feature in Disneyland California, which do not appear in the Paris park, are the hidden one in Big Thunder Mountain Railroad just before the bat room and the one which appears in the Firework Spectacular. 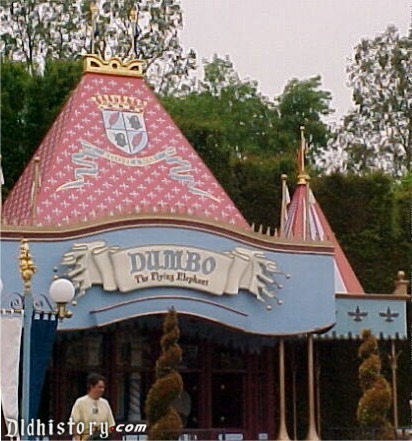 Neither park has a Dumbo themed restaurant or the equivalent of the Baby Mine shop, found in Tokyo Disneyland, named after the Academy Award nominated song from the movie. Both Paris and California featured Goofy "driving" a Casey Jr. float (based on the tender engine which hauls the circus train at the start of Dumbo) in their Electrical Parades, but France never featured the later float with Dumbo himself on.